At 120mm in diameter and 60mm wide, these are some seriously burly little wheels. 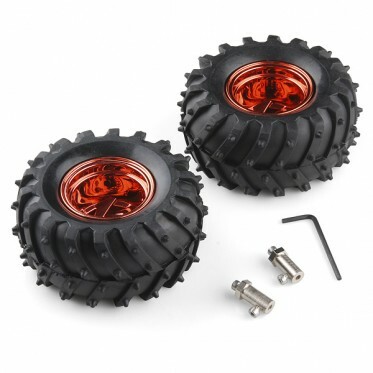 The tire is soft black rubber with deep tread and spikes for added traction in rugged terrain. An adapter is included which bolts to the back of the hub and easily mounts to any motor with a 4mm output shaft. We're selling these wheels in pairs.